Save $25 – early bird pricing ends June 16. 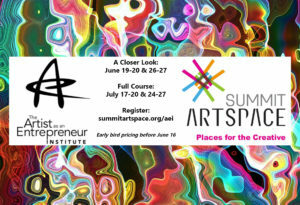 For the fourth year in a row, Summit Artspace will offer its popular Artist as an Entrepreneur Institute. This full, comprehensive course includes 24 hours of instruction by leading area artists, entrepreneurs, and business experts. Please email julie@summitartspace.org with any questions. Understanding ones current capacity is essential to properly developing the tools and resources needed to become sustainable. By using a self-assessment tool, artists will reflect on: their current product or service, resources, individual capacity, current markets and their economic impact. The major components of a business/action plan will be studied. By reviewing sample plans and brainstorming with an artist’s peers, the artist will learn how to recognize the difference between effective and ineffective plans. In addition, the difference between for-profit and non-profit will be discussed with relation to how this choice has an impact on specific elements of the plan. What are the factors that influence audience preferences? How can artists tap into these preferences with new goods or services? How can artists overcome pricing limitations through the creation of new products and services? How can a service portfolio without drifting from their mission? Through unique partnerships, artists can have a profound impact on their community. This module allows artists to explore collaborative options by leveraging their current creative skill set in diverse ways. A panel of creative professionals who have experience in these partnerships will offer insight into this topic area. An initial framework for determining a price strategy is reviewed. Specific attention will be paid to understanding costs and market forces. In addition, consideration of how distribution channels affect overall price will be explored. Various tools used to protect the artist and their artistic product (including copyrights, trademarks and contracts) are described. An expert will provide guidance on the requirements of each of the tools and counsel on how to best take advantage of them. The major components of a Marketing Plan will be studied. By reviewing sample plans and brainstorming with an artist’s peers, the artist will learn the essential elements to a well-constructed Marketing Plan. In addition, the artist will explore ways the plan can be leveraged to suit the needs of their work in specific markets. Whether it is for an artist’s studio or living space, their health or for other purposes, finding and selecting the appropriate type of insurance is an important step in building a sustainable creative business. This module will define types of insurance, the importance of each and strategies for selecting the appropriate types based on the individual artist’s needs. In addition, local, regional and national resources will be provided for additional guidance. Understanding who the artist’s current and potential audience is and what motivates them to purchase a particular product or service is essential to attracting and retaining audience members. Discussion will focus on defining market research, establishing what information can be gained through research, examining strategies appropriate for artists, and how these strategies can be put into practice. This module will explore effective communications strategies based on an artist’s particular background. The module will also address the variety of communication outlets available and strategies for how to maximize exposure. Artists are in the unique position to be the direct advocate for their product and/or service. This module offers the opportunity for the artist to gain a greater understanding of the information surrounding their product and/or service portfolio, how this knowledge can be leveraged in practical sales methods and strategies and additional resources that address this topic area in more detail. A number of factors need to be considered when seeking funds for an arts-based business. During this module, sources of funding as well as tips on how to work and make a good impression with potential funders will be presented. In addition, revisiting the definitions of non-profit and for-profit structures will help to shed light on specific funding options for these two business models. The major components of an “action plan” have been studied. Now it’s time to take this framework and build it into something that can be applied to your own artistic path. This module is designed with the sole purpose of allowing individual artists the opportunity to revisit the major themes of the business plan, and to have the opportunity to design their own course of action with the guide of the instructor and/or peers. It is important to Summit Artspace to keep adding value to the program. Once the course ends, participants are able to continue meeting at Summit Artspace to work with experts and complete their business plans.